20% Off Orders at Vistaprint Save 20% at Vistaprint when you shop using our discount code. 25% Off Selected Clothing Orders at Vistaprint Save 25% on clothing from Vistaprint. 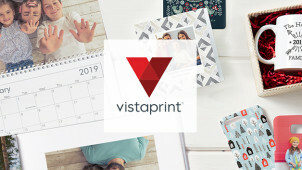 15% Off Orders at Vistaprint Whether you're after business cards and marketing materials or Invitations and photo gifts you can save a brilliant 15% when you use this code! 25% Off Marketing Materials Orders at Vistaprint Get essential marketing materials for even less when you use our promo code at Vistaprint. 20% Off First Orders Over £35 at Vistaprint New to Vistaprint? Make your first order count with 20% off when you spend £35! Up to 50% Off Business Card Orders at Vistaprint Use our Vistaprint code and see how much you could save on business cards! 25% Off Labels and Stickers Orders at Vistaprint Don't forget to apply our Vistaprint discount code at the checkout to get 25% off! Since 1995 Vistaprint has been providing individuals and small businesses around the globe with incredible value solutions for all aspects of printed goods. Offering a service that was previously unavailable without huge investments established Vistaprint as a world-class company, and with more than twenty years in the game. their popularity hasn’t waned. Rather, they have gone from strength to strength, and are today the world’s leading supplier of custom-printed supplies. With a staggering range of products on offer, Vistaprint has everything you could possibly need. Whether you’re after fridge magnets, hats, business cards, mouse mats, calendars, mugs, hoodies or stationery, Vistaprint has it all and more, and with astounding quality guaranteed. With their easy-to-use customisation tool, you can simply upload your design and unlock your inner graphic designer. Elementary to use but with professional-standard results, Vistaprint can help you create the custom printed products you’ve been dreaming of. As Vistaprint literally invented the technology to provide you with high-quality printed products, you can rest assured about the standard of service you’ll receive. The originals and the best, why go anywhere other than Vistaprint? How do I use my Vistaprint promo code? Sign up to Vistaprint’s newsletter to get access to exclusive news and sales. What payment methods do Vistaprint accept? Vistaprint accepts payment via Paypal, Visa, MasterCard, American Express and Discover Card. How can I get a pricing quote from Vistaprint? You don’t need to request a quote and wait to hear back from Vistaprint, you can see the costs upfront with their pricing tab. Do Vistaprint offer free samples? Vistaprint want you to be confident in the quality of their products, so offer a free sample kit containing leaflets, flyers and more. Can I get a Vistaprint student discount? You’ll find a range of student business cards with a delightful discount automatically applied! Or you can get in touch via email or their live chat service online here. Vistaprint believes strongly in the quality of their products, therefore they offer that if you’re not satisfied with your product they will reprint or refund it, and even cover delivery! Vistaprint’s phone helplines are open 24 hours. The first and last word in quality printed products, Vistaprint has been supplying the world with fantastic personalised goods since 1995. Grab a Vistaprint promo code today and you’ll have access to awesome savings across an absurd amount of products, from business cards and t-shirts to fridge magnets and bumper stickers. Up your marketing game with a variety of products on offer that don’t in any way compromise on quality, with incredible printing solutions on everything it offers. Vistaprint’s mission is a simple one; they set out to provide small businesses with the same high-quality of personalised printed products that, until then, only bigger companies could afford. More than 20 years later and Vistaprint have established themselves as the world’s leading supplier of personalised products. Innovators in every sense, Vistaprint developed new technology to be able to print these custom goods in small batches, thus realising their dream of providing fledgling companies with quality custom wares. Improve your work uniform this spring with Vistaprint, and make your clothing as unique as your business with its fantastic range of customisation options. With t-shirts, hoodies, caps, bags and more on offer, grab a Vistaprint discount code to save big on your custom garments. With respected apparel brands like Beechfield, Gildan and Fruit of the Loom, and a variety of options such as embroidery and DTG printing, Vistaprint has everything you need to create quality custom clothing.